Although nitrogen occurs naturally in the environment and is necessary to support plant life, nitrates can become serious water contaminants. When taken into the body, nitrates convert to nitrites and are the cause of a number of serious ailments, the most known being “Blue Baby” syndrome. The main source of nitrates in drinking water is agricultural fertilizer. Other sources include human sewage and livestock manure. Please refer to the Pure Water Products’ Nitrate Factsheet. The EPA, which sets a Maximum Contaminant Level for nitrates at 10 parts per million, recommends two methods for removing nitrates from water–reverse osmosis and ion exchange. For drinking water in the home, reverse osmosis is the most common and easiest to apply. A simple undersink reverse osmosis unit easily removes 95% or more of nitrates from tap water. Small home distillers can also remove nitrates, as can specially designed ion exchange cartridges for standard water filters. 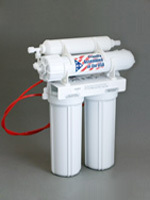 A standard undersink reverse osmosis unit removes nitrates easily. Nitrates are not removed by faucet filters or refrigerator filters. For larger amounts of water, from single residence wells up to small municipal sizes, the most common removal techniques is ion exchange. Municipal water treatment plants also resort to blending, a technique by which water with a high nitrate content is mixed with water with a lower content to produce a blend that meets standards. Ion exchange, in the case of nitrate reduction, is more precisely anion exchange. The ion exchange system used for nitrate removal is very similar to a water softener but instead of using softening resin, which is a cation ion exchange resin, nitrate removal systems use an anion exchange resin. Both systems use sodium chloride salt (brine) to regenerate the ion resin bed. Nitrate removal is not as simple as hardness removal. Two basic types of anion exchange resin can used, either Strong Base or Nitrate Specific. The latter is more expensive, costing usually about 50% more, but simpler to use. It is frequently used by private well owners because it is more easily managed. A Type II Anion (strong base) is best applied to municipal supplies where there is regular testing and maintenance of the system. Because Type II Anion resin is not nitrate selective there will be other ions, primarily sulfate, that compete for the exchange site. To properly size up this system, a complete water analysis will be required to ensure complete compliance and avoid nitrate “dumping” as the system approaches exhaustion. The nitrate level during dumping can be many times higher than the untreated nitrate concentration. Nitrate selective anion resin is an option used principally on smaller municipal systems and private well sources. Nitrate selective anion resin strongly prefers the nitrate ions to the competing sulfate ions. With this resin we avoid nitrate “dumping”. In general this resin may be up to 50% more in cost.